I am one of those small church pastors out there. I laugh every time someone calls asking for the Sr. Pastor, I feel compelled to explain to them that I am the pastor, not Sr., just the pastor. I do the same thing when people ask about our youth director, Christian education person, or secretary. “I’m the pastor,” I say, and go on to explain that there is no one else here but me! My congregation is one of those small membership congregations out there. I am not sure what this means exactly, other than the fact that there are not a lot people sitting on the pews. On average we might have 60 or so people a week. We gather to pray, sing, hear, and gather around table. Then there are the other times of gathering: funerals, showers, the occasional bible study that 3 or so people attend, and the annual communal festivities. Often when the “leaders” gather there is much talk about growth. They want to have a better church, bigger church, a church that offers more things for their people, a church that would need a real sanctuary. Then reality sets in, bills are talked about, concerns are brought, what if’s become prevalent. Maybe we won’t be able to get there after all . . . I wonder what “get there” means? It’s not only them. I have my own agenda, my own desires, my own dreams. 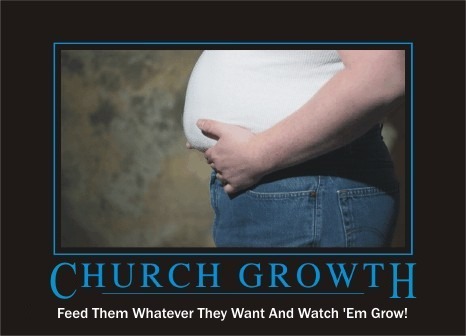 I would like for this congregation to grow also. It would be nice to have more people here, maybe that way I will not be alone during the week, I could preach to more people, I might even get to worship in an actual sanctuary! No Growth = bad pastoral leadership! Would it be a bad thing if I do not want more people in church? See, the truth is that there are some proven ways to get more people in a place. I remember my days in retailing when we would have all sorts of tricks to increase traffic, from lower prices to glitzy windows, we would work hard at making sure that more people came. The more people that walked through the door the better opportunity we had to make more sales. Unfortunately I am not sure that this necessarily works in the church. I do want more people to experience the gracious love of God. But I know that this might not translate into more people in my church. Plus I am not sure that my own congregation has good reasons why they want more people. Survival seems to be the main reasons why more growth is wanted. The conversations are about our death and demise as a denomination and local church. I’ve been guilty of using the “if you don’t do x you will die” type of scare tactic hoping that this will make a difference. Yet, like our children, churches at some point stop responding to scare tactics and bluffs. Something does have to change. But I am unsure that the something is our worship style, our preaching techniques, and our gatherings. I know in me it is my attitude. I cannot fear the career formula. Instead I can only continue to be present for all of God’s people, hear their stories, remind them of the larger story, and invite them to claim the story as their own. Doing these things makes church incarnate, changing the way that church is done in most places today. The focus of the gathering is empowerment for the mission of active/incarnate proclamation in the world. This way of being church might not, numerically and/or financially, benefit the local congregation but it does benefit God’s kingdom. I’m tired of the death talk. We talk, and talk and talk some more. We complain that young people are not coming, that they do not have the commitment needed. We complain that they are not as religious, understanding, and moral. We spend inordinate amounts of time hearing, studying, pondering, reflecting, on what will work, all in the comfort of our four sacred walls (local or not)! I wonder when we are going to get out there, to heal, feed, clothe, and bring back to life? When are we going to take a chance on what God’s Spirit is doing in our communities, even if it does not grow our church?